UPDATED, Feb. 27, 2011 — The Catholic Church announced Feb. 26, 2011, that José Rodríguez would be released and deported to Spain. 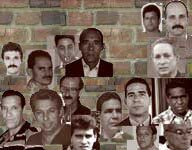 Cuba's government is a dictatorship, reserving for itself all power and discretion, so it doesn't need to rule of law to justify throwing people in jail, especially those who dare to challenge and oppose the Castro regime. But it goes through the motions just the same, charging its political opponents with "disobedience" or "disrespect," as if they were children in need of "re-education" more than criminals. The most bizarre of these "charges" is "pre-criminal social dangerousness." You can give yourself a wicked headaches trying to dissect this bit of Orwellian double-speak: So people charged with this are dangerous but not criminal? And how can the dictatorship tell when someone is at risk of slipping into "criminal social dangerousness?" Relax, because the answers to those questions really don't matter. It's just a term the dictatorship made up to silence and to treat as "criminals" its opponents, complete with a punishment of up to 4 years in prison. The Castro gulag holds plenty of these "dangerous" men and women in its dungeons. They includ human rights activists Leodan Mangana López and José Luis Rodríguez Chávez, who were each arrested this past February, tried before a secret court, convicted and sentenced to 4 years in prison. There is not too much available on the Internet about these two men, both members of the Cuban Foundation of Human Rights. Mangana also operated an independent library, and Rodríguez, vice president of the human rights group's Havana chapter, last year hosted a "fasting center" where activists could demonstrate their support for Cuban political prisoners with hunger strikes. "Dangerous" activities, indeed — at least in Cuba.